One of the oldest displays in the Houston Museum of Natural Science is our full scale recreation of the dinosaur Ankylosaurus. This recreation of a late cretaceous herbivore was created by the Sinclair Oil Company for the exhibit “Sinclair Dinoland” which opened at the 1964-1965 Worlds Fair in New York. Dr. Barnum Brown acted as a consultant to world renowned zoological sculptor Louis Paul Jonas to create a paleontological menagerie of dinosaurs that would showcase the Dinosaurs of the Mesozoic. This would be the end of Dr. Barnum Brown’s long paleontological career and association with Sinclair oil as he died shortly before the fair opened in 1964. The dinosaurs were created at Louis Paul Jonas Studios and then transported to the fair grounds past New York City on a flat barge in a brilliant and surreal publicity stunt. You can hear the original audio from the Sinclair Dinoland exhibit labels from the 1964-65 Worlds Fair by clicking here. 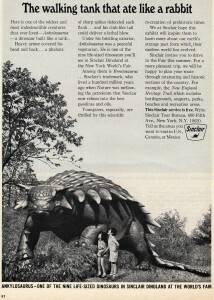 In addition to carrying the Sinclair banner at national stops by train and flatbed trucks, the dinosaur sculptures were used by Sinclair in other advertising campaigns, such as this print ad featuring the Houston Ankylosaurus advertising the dinosaurs and the Dinoland exhibit. After the closing of the fair, the models toured the country on specially constructed flatbed trailers. Visiting Houston in 1966 and 1968, the nationwide tours attracted millions of visitors. One of the Houston visits was to Gulfgate Mall- the first shopping mall in the city. The second, was to HMNS. The Museum, newly expanded in 1969, had empty space and the popularity of these visits was not lost on HMNS. By 1969 the tour had ended. Sinclair Oil was being bought out by Atlantic Richfield and the famous Brontosaurus logo was mostly retired. Smithsonian Institute had declined the offer of the collection. The dinosaur menagerie was put into storage. taken recently on a HMNS Field trip. Texas offered up a unique home. Dinosaur Valley State Park, located along the Paluxy River near Glen Rose, was in its infancy. The park site contained scores of dinosaur tracks from the early cretaceous and initially it was thought that the entire collection would go to the newly created dinosaur themed state park. However, with the corporate take-over by Atlantic Richfield and competing interested parties, that deal fell through. 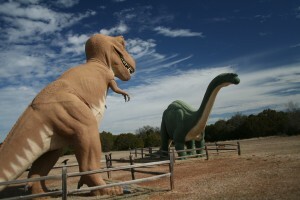 The park became home for the Tyrannosaurus rex and the Brontosaurus, which can still be seen on display in the park. The remainder of the collection was distributed across the country. These two models (seen left) originally had moving parts, the jaw opening and closing on the Tyrannosaurus and the neck moving on the Brontosaurus. These simple motions thrilled the children of the 1960s and represented the first step in the creation of moving lifelike robotic dinosaurs such as the defunct Dinamation, and in 2008 the Toyota Center show Walking with Dinosaurs. Out of the collection, two dinosaurs are officially listed as whereabouts unknown. 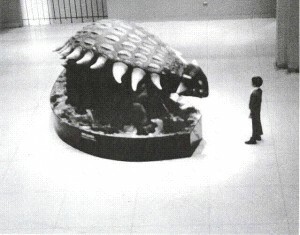 Thought by Worlds Fair Historians to be at the Cleveland Zoo and now listed as “lost,” the Ankylosaurus has been exhibited continuously at HMNS since 1970 when it was officially donated to HMNS by the President of Atlantic Richfield. The Ornitholestes, however remains lost. The smallest of the Dinoland sculptures at 6 feet long, this small dinosaur could easily be in some enthusiast’s living room, garage, rock shop or pancake house anywhere in America. How do you hide an elephant in a cherry tree? You paint his toenails red. During the time the Sinclair Dinosaurs were touring the United States on flatbed trucks I thought this joke was very, very funny. In a sense though, that is one reason the Ankylosaurus has remained “missing.” This is not for lack of looking or curiosity. Both the 1964-65 Worlds Fair and the Sinclair Dinoland exhibit have a substantial fan base today, and original souvenirs still sell for a premium. Cosmetic surgery is a popular trend now and to stay good looking the Worlds Fair Louis Paul Jonas’ Ankylosaurus had some work done- albeit not in plastic surgery but in fiberglass. So at the time when photographs of exhibits and artifacts were made available via the internet, the Jonas Ankylosaurus had a dramatic new paint job, a bellowing face lift and a dynamic repositioning of his derriere. The makeover also created a new formidable base featuring a large oak-like tree a not to mention a pack of harassing carnivorous Dromaeosaurs. The missing Jonas Ankylosaurus commission has been hiding in plain sight in Houston Museum of Natural Science Paleo Hall for almost 40 years! The Jonas Dinosaur menagerie was conceived as being an outdoor exhibit, and after the fair and all the national tours, all but two of the sculptures in the collection ended up as open air exhibits. The Houston Ankylosaurus remained indoors and, though modified, it is perhaps the best preserved of the Sinclair Dinoland models. The ankylosaurus has been my absolute favorite dinosaur ever since I first visited HMNS in first grade. AWWW growing up, I’d always put my hand in his mouth and when he didn’t bite down on it, I declared him my friend.